The windows that line this bar easily open and close, depending on the weather. This feature allows the owners to use the indoor space throughout the year, even after they’ve shut down the patio for the year. Maybe it’s your nose that leads you up the staircase of this Little Italy home, through a cozy gathering area and out toward the one-of-a-kind grill that’s occasionally mistaken for a fireplace. Perhaps it’s a whim for some fresh air—and a gorgeous view of the surrounding bustling neighborhood. Then again, maybe it’s the rumble of laughter and good cheer coming from the group that often gathers around the bar. No matter the reason, you won’t be disappointed with the outcome. Indoors or out? 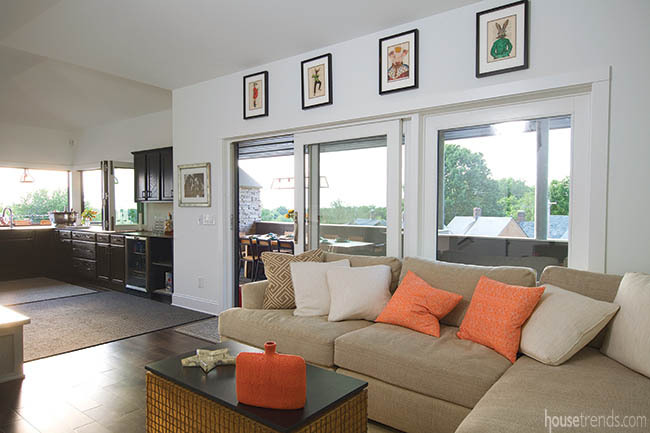 The fourth level of this home is an appealing hybrid of the two. The staircase opens to a sitting area with a large sectional sofa that’s perfectly positioned to offer either a view of the outdoors, or an unparalleled view of the large television. A dark hardwood floor runs underfoot, creating a striking contrast to the neutral décor. The design itself seems intent on fading into the background and offering the spotlight to the lush green trees that stretch past the windows on one side and the colorful collection of buildings on the other. The well-stocked bar is just a hop, skip and a jump away from the sitting area. Rough-cut Oak cabinets, both upper and lower, hold every kind of entertaining essential, a mark of a good—and frequent—host. “The owner loves to entertain, and he’s a great cook,” says interior designer Barrie Spang of Sapphire Pear. “So that was a huge part when we were designing this.” For her part, Spang was involved from the very beginning, often working closely with the architect and homeowners to ensure that the owners’ dreams transformed well from paper to reality. “From the very first meeting with the architect, I was involved,” she says. A small glass front refrigerator tucked between a row of cabinets and an open storage space allows for easy access to chilly beverages on a warm day. 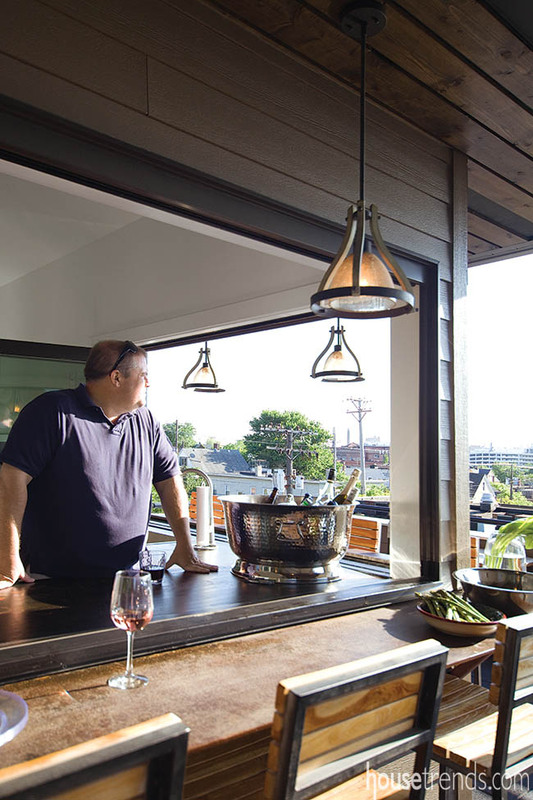 The windows that run along the bar’s edge easily accordion into themselves, creating a room that can be sealed off in the winter or opened to the elements in nicer weather. “When you open up the glass, the inside and the outside are one in the same,” says the owner. The extensive open-air deck offers just about everything that this active couple could want in terms of outdoor living. “I’d say about 60% is undercover, so if we have people over and it rains, it doesn’t change what our plan is, we still eat outside,” the owner says. A Big Green Egg grill—a gift from the owner’s brother—takes up residence in the very back corner of the deck. A run of weathered stadium seats purchased from the Cleveland Browns stadium comes next. A chic herb garden is tucked into the corner. 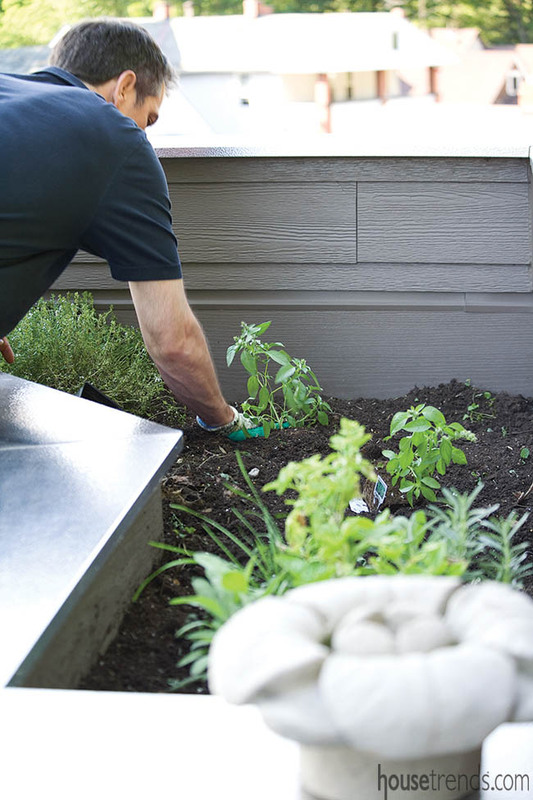 The owner tends to the plants himself, often using the sage, basil and lettuce in his culinary concoctions. 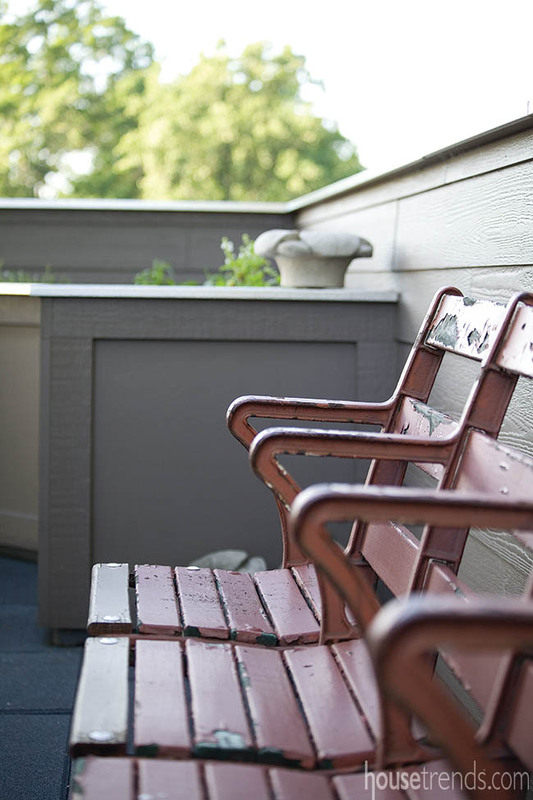 The other half of the deck is where the real action takes place. A lengthy reclaimed wood table with a live edge is the only piece of furniture on the patio that stays outdoors when the weather turns sour. The chandelier dangling over the table is just one of the many eye-catching light fixtures in the area—all of which are from Hinkley Lighting. 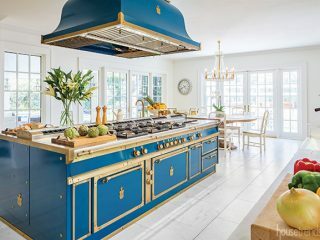 The one-of-a-kind grill takes up residence between the table and bar area, letting the homeowner-turned-chef mingle with his guests while dinner cooks. 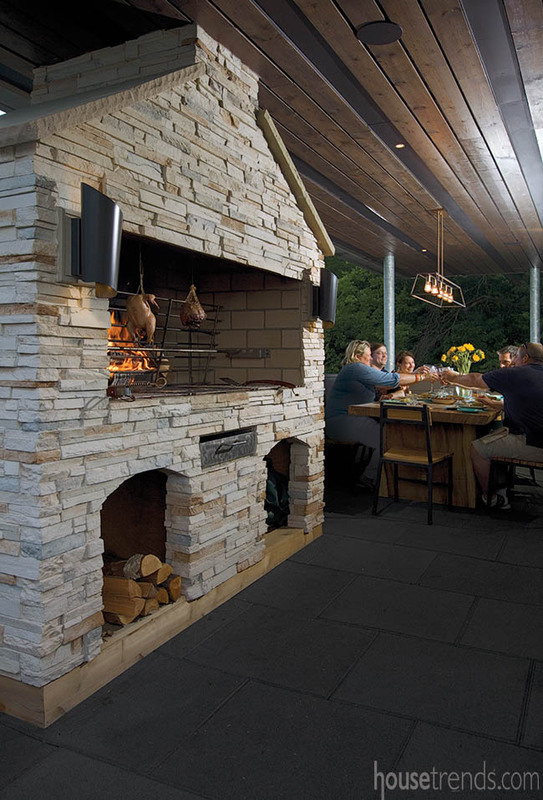 The grill—and its unique design—is one of the owner’s favorite parts of the patio and he’s not shy about using it or describing the design, which was centered around something that he first saw while vacationing at a villa in Italy. “It’s a wood burning grill where logs burn on the back wall and as they burn the embers fall, and then you cook over the hot wood ember,” he explains excitedly. 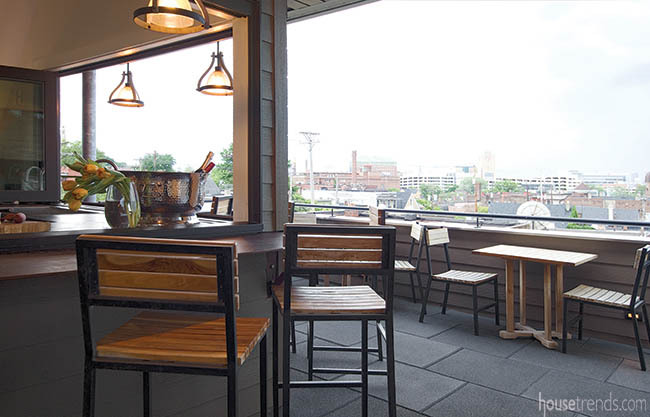 This patio is all about entertaining and enjoying time with friends, as evidenced from the large table and the stools gathered companionably around the bar. However, that does not mean that privacy is out of reach. A couple of low tables, with seating for two, are tucked against the patio perimeter, positioned just-so to give those seated there glimpses of the surrounding area, an eclectic collection of homes, churches and cozy restaurants. 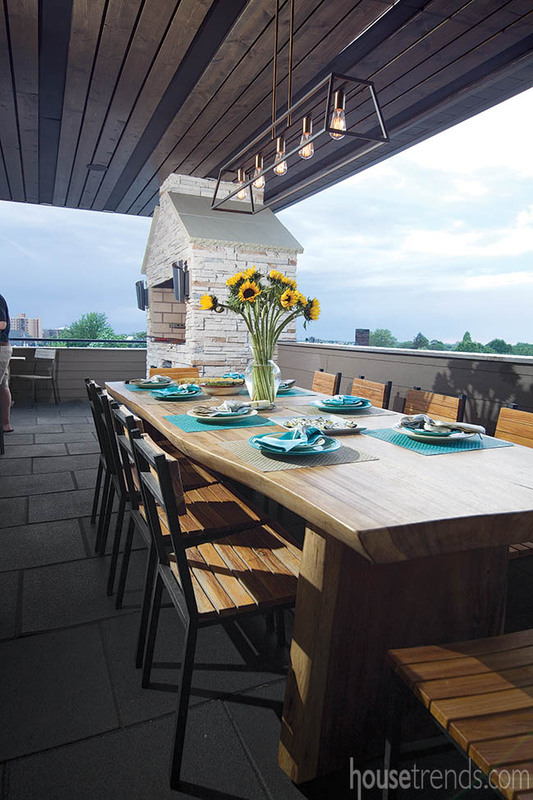 The owners adore their rooftop patio, using the space whenever weather permits, and when it doesn’t, they simply pull the windows shut and move the party indoors. Whether it’s a rowdy crowd gathering for a party or just the two of them sipping a glass of wine and chatting quietly as the sun slips low in the sky, this space doesn’t disappoint.